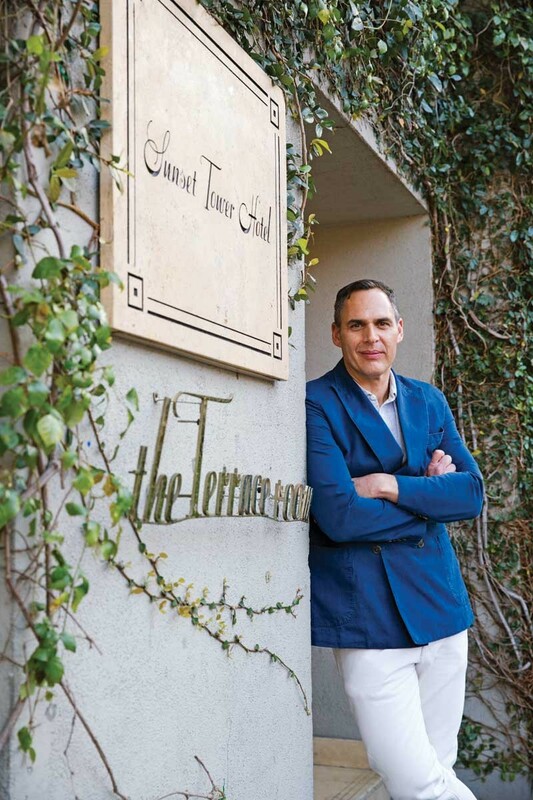 Ten years ago, hospitality magnate Jeff Klein officially reinvented the iconic Sunset Tower Hotel. We checked in with the ex-New Yorker to both reminisce and look forward. How did this place fall into your lap? I’ve always been in the hotel business, and my former business partner [Peter Krulewitch] told me there was a building for sale in L.A. that we could get really cheap. I didn’t want to be in L.A. or even schlep out here, but I did, and I fell in love with the place. At the time, it was The Argyle hotel. They couldn’t give it away. What condition was it in? Rooms were $99 a night, and so dumpy. This building was built in 1929, and it has incredible history. It was really beautiful and glamorous when Howard Hughes and Bugsy Siegel lived here. John Wayne lived in what is now the spa! By the ’70s, it became a derelict building, because Sunset Boulevard was part of the beatnik culture. I have pictures of the building with windows broken; there were squatters living here. They were going to tear down the building, but it became a historical landmark. It was finally opened up as a private club in the late ’80s. The décor was tacky, and they eventually went bankrupt. An Asian investor bought it, and he couldn’t make money, and then I bought it. 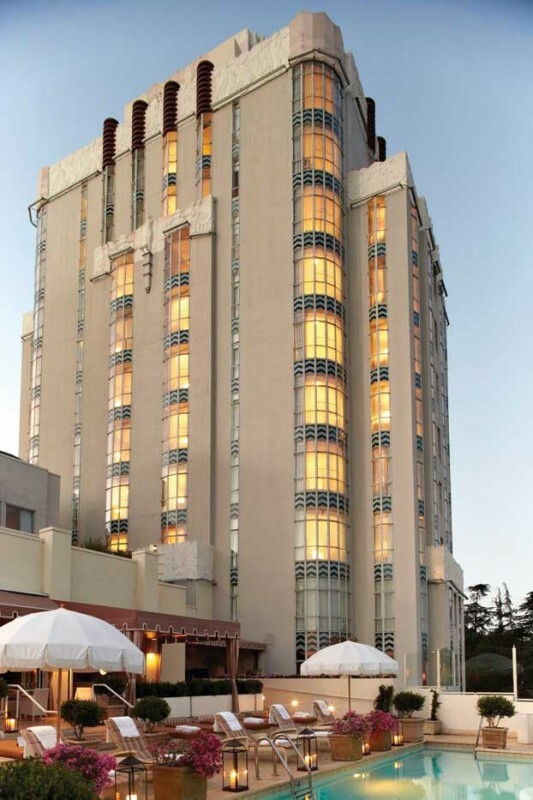 I knew right away it should be a younger and cooler West Coast version of the Carlyle. Everybody thought I was crazy. At the time, places that had super trendy nightclubs in the lobby were working. They didn’t think that Los Angeles was sophisticated enough for this kind of product. I wish I was smart enough to say I knew it was, but I didn’t. I was young and stupid. I could have lost everything, so I’m happy that it worked out. How did you bring the place back to its original glory? The exterior of the building is historically protected, so I didn’t touch that. I hired the designer Paul Fortune, who did Marc Jacobs’ apartments in Paris and New York. Marc was very fond of him. Paul has great taste, and he was the absolute right choice. He gave it his heart and soul. The Tower Bar is now a regular haunt of the A-list. What kind of place did you aim to create? Hotels often get their personalities from their restaurants. I wanted the Tower Bar to be super sophisticated but never too formal or fancy. Last night, Bruce Weber was there in his jeans and T-shirt with a bandana on his head because he feels completely comfortable. The first year was a constant battle as I tried to make it casual chic. [Storied maître d’] Dimitri [Dimitrov] was very fancy. Like an old-school maître d’. You almost picture him with a napkin on his arm. He came to you through Tom Ford? Tom and Mitch Glazer both recommended him. He was the maître d’ of this really weird caviar house, where there were, like, four tables and he had a staff of 20 queens behind him, and he’d snap his finger and two would walk out and pull out your chair. It was almost like a Monty Python movie. Dimitri got to know a lot of Hollywood’s inner circle there. Even though there were only four tables, they would be filled by people like Tom Ford and Tom Cruise. Those relationships have ended up becoming very important here. People always say the Tower Bar is like a rich person’s Cheers. You always know a lot of people in the room. Why do famous people feel so comfortable here? We’re super private, so that helps, but it’s a combination of 1,000 things. Somehow, the planets have aligned for this property. It’s the location, the facade of the building, Dimitri, the design…maybe even I play into it. What do the customers adore about Dimitri? He’s so welcoming and hospitable and sweet to 80 percent of the people. But if he doesn’t like you, he doesn’t like you, even if you’re famous. Mostly, he’s not nice to people if they aren’t nice to him or the staff. You hosted the Vanity Fair Oscar party here for five years. It was so great. It totally put us on the map. We were an insidery thing before, which is probably why Vanity Fair wanted to do the party here. But once they came, boom! There was international publicity. It was wonderful for us. It sounds so cheesy, but I see movie stars here all the time, so of course seeing Leonardo DiCaprio is impressive, but it’s the more unexpected customers who excite me. The last time I was impressed was when Lisa Vanderpump came in. I was like, “Oh, my God! Oh, my God! I’m wearing the totally wrong outfit.” The day before Lisa came in, Brad and Angelina were doing an interview with NBC News in their suite. They’ve been here before, but I didn’t go say hello or bother them. But when Lisa came, I introduced myself and told her that I love both of her shows. Have you been to [Vanderpump’s West Hollywood restaurant] Pump? Of course! Caitlyn Jenner is another one I get excited about. I like her! Any paparazzi moments over the years that have been memorable? We have great security. We’re very protective. We make it difficult for the paparazzi to get in. We put umbrellas in front of their faces, which is legal. We don’t want to become “that” place. That’s my fear. Celebrities get so much swag. How do you make them feel special? I don’t give anything for free, and I think they like that. Making them feel welcome is important, but also not like you are begging them to come. When is your next hospitality project, the San Vicente Bungalows, going to open? Probably in two years. We’re going to close down for construction probably in June, and we’re going to reopen as a very high-end hotel and restaurant. It’s full of super-cute bungalows that were built in the 1800s. There will be a bar and screening room. There’s a lot of outdoor space with an outdoor grill and rotisserie, so it will have a wood-burning oven and a Mediterranean menu. 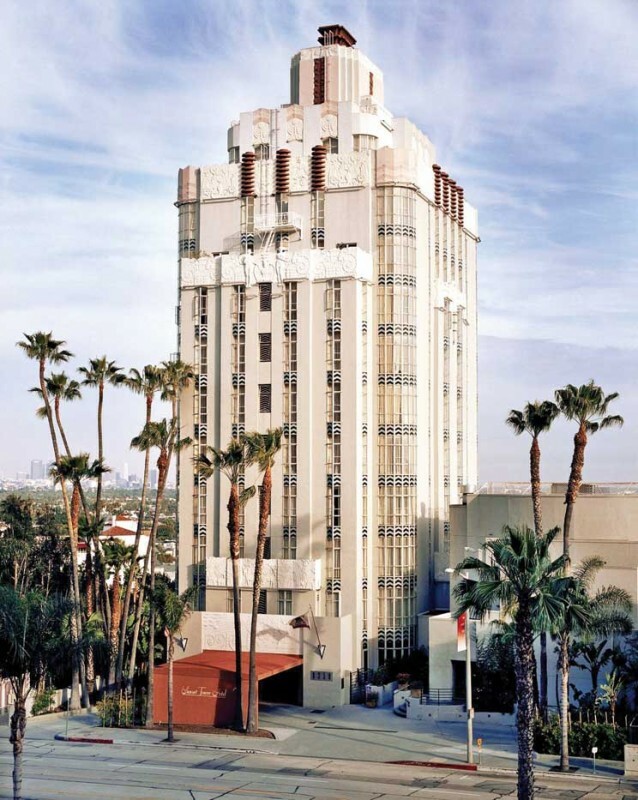 What’s next for Sunset Tower? In the next year or so, we’re going to be doing lots of refreshing. We are taking down the ceiling in the Terrace Room, so there is more indoor/outdoor availability, which will be great, because everybody loves outdoor space. We’re going to be replacing a lot of the furniture. I’m also refreshing some of the rooms. It will still feel the same, just fresh and new. I’m constantly fine-tuning the Tower Bar, but I can’t touch it, because people would rebel! Have you always been so detail-oriented? 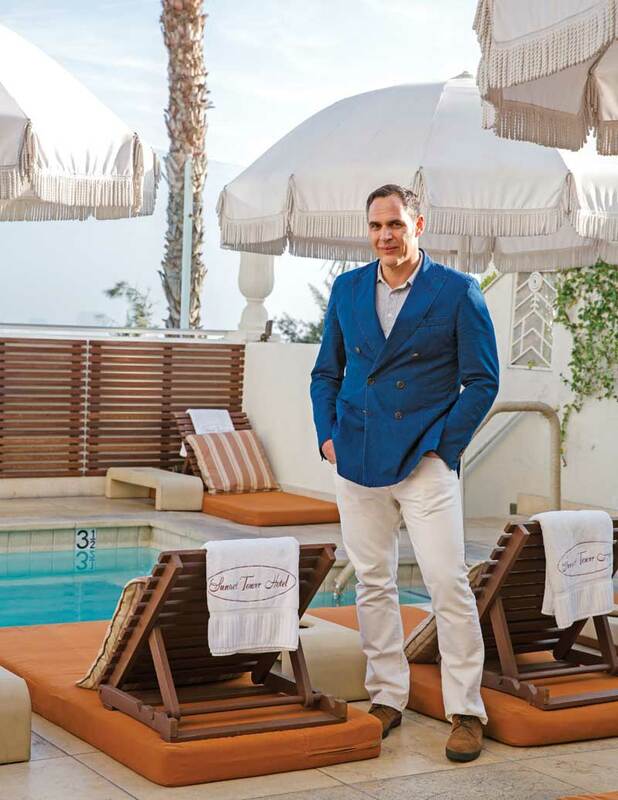 I started as a bellman and worked myself up in the hotel business, and that’s part of the recipe. We’re focused on service and delivering a great experience. There are a lot of people who own hotels, but I am a hotelier. I mean that humbly. I work. I come here every day to make sure that everything is working well. I truly value the personal commitment to make other people feel special, especially when they are visiting your home (hotel). I enjoyed reading this article. Very nice read at the end of a busy day!